(WASHINGTON) — Ninety-six percent of state lawmakers who voted in favor of a gas tax increase and faced reelection in 2018 primaries will advance to the Nov. 6 general election, according to new data from the American Road & Transportation Builders Association’s Transportation Investment Advocacy Center™ (ARTBA-TIAC). The 2018 primaries saw 802 legislators who voted on gas tax increase legislation from 12 states – California, Iowa, Indiana, Montana, Nebraska, Oregon, South Carolina, Utah, Oklahoma, Tennessee, Michigan and Washington – run for reelection. Of those lawmakers, 558 voted in favor of a gas tax increase and ran for reelection, with 538—or 96 percent—advancing to November’s general election. The numbers include 97 percent of the 263 Democratic lawmakers, and 96 percent of 295 Republican lawmakers. Of the 222 legislators who voted against a gas tax increase and ran for reelection, 216—or 97 percent—will move on to November’s general election. This includes 96 percent of 52 Democratic lawmakers, and 97 percent of 170 Republican lawmakers. An additional 22 lawmakers did not cast a vote on a gas tax increase measure and ran for reelection. The results support earlier findings from ARTBA-TIAC that showed voting for a gas tax increase does not affect a lawmaker’s chance of reelection. In the 16 states that increased their gas tax rates or equivalent measures between 2013 and 2016, nearly all (92 percent) of the 1,354 state legislators who voted for a gas tax increase and stood for reelection between 2013 and 2017 were sent back to the state house by voters. Of the 712 elected officials who voted against a gas tax increase, 93 percent were also given another term. More information on the results, and studies on state and local transportation investment and legislative and ballot initiatives can be found at www.transportationinvestment.org. The Center says it plans to do a similar report to compare the results following the November general election. 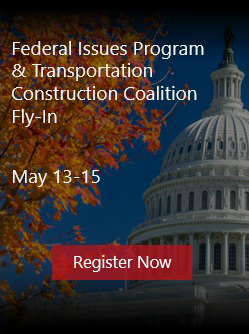 Established in 1902 and based in Washington, D.C., ARTBA is the “consensus voice” of the U.S. transportation design and construction industry before Congress, federal agencies, the White House, news media and the general public.